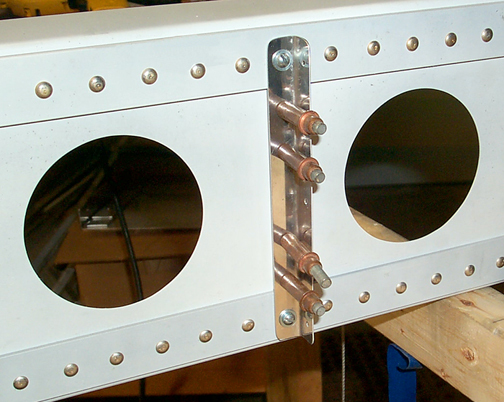 The ribs attach to the main and rear spars via .032 aluminum angles. 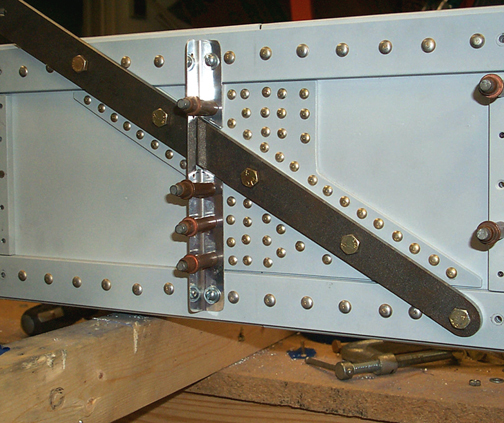 The plans call for 1/2" X 1/2" angles, however, I have found that with the 5/32" rivets used on the main spar capstrips, there is inadequate edge distance. Therefore, for the main spar attach angles, I have decided to go with 5/8" X 5/8" angles to give better clearance and edge distance. Most of the ribs are oriented with their flanges facing the wing tip. A couple, however have the flanges facing the root end of the wing so check the plans as you go to get them oriented correctly. The Rib Attach Angles were then deburred, cleaned, Alodined, and Epoxy Primed. Once the primer had cured, the attach angles were riveted to the Main Spars. In the picture above, you can see one of the angles is reversed. That is the number 8 nose rib. Per the plans, it and the corresponding center rib behind it, have the flanges facing the root of the wing. The other ones face outward towards the tip of the wing. Also notice how nicely the #5 rivets fit the 5/8" angles with plenty of edge distance and clearance. No problem getting a rivet set on these. I highly recommend doing the 5/8" X 5/8" angle on the main spar and save yourself some headaches. That's it for the attach angles and for the main spars. 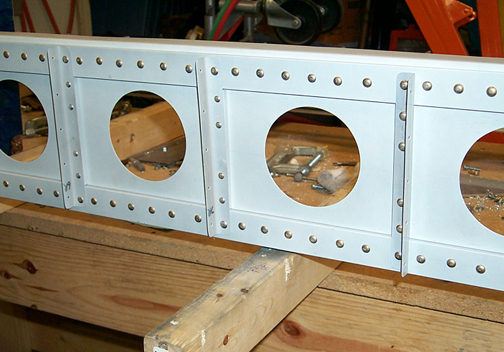 I have adjusted the main spar build time to reflect building making, fitting, drilling and priming these attach angles. Believe it or not, this added an additional 27 hours.